AJ’s Walleye Lodge in the North Shore of Lake Gogebic in Bergland has two major trump cards when it comes to snowmobiling: the first would be direct access to seven major trails within three miles – no need to ride the same trail every day to get to the good snow and trails; the second is this is where the good snow is found. Lake Superior provides the moisture, while the Porcupine Mountains provide the lift to the moist air and down comes the pretty white snow on our roof. If that’s not enough to win you over, how about 21 units that can comfortably sleep up to 120 guests? Our units are clean, comfortable and every room has a view of the lake. From standard rooms, to kitchenettes, to fireplace suites, to two bedroom units, we have a wonderful mixed bag that will meet (and exceed) most needs. 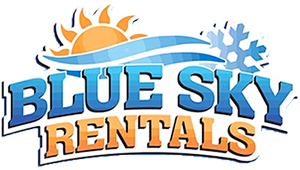 We rent all units by the day, week or month. In addition to our convenient location right on the North Shore of Lake Gogebic, we also have plenty of safe and convenient trailer parking, a heated shop, 2 rental/repair shops located within 1 mile from the property, 2 gas stations, a grocery store and two restaurants within 1-2 miles from the property. 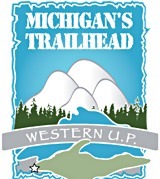 Trail permits are available on site as well as a live bait and tackle shop if you choose to do any ice fishing, and a gift shop in the event you have left anything behind! 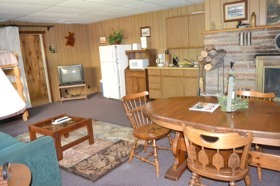 The Walleye Lodge has 21 units – all of which have a view of Lake Gogebic. All rooms are very clean, comfortable and 100% smoke free. We offer free WI-FI, cable and and feature daily towel exchange and garbage pickup. Charcoal and gas grills, picnic tables, and a fire pit are available for all guests to enjoy. Nine completely furnished housekeeping units are located on the lower lakeside level. Two deluxe suites, each with two bedrooms and a full sun deck, are among Lake Gogebic’s finest accommodations. These units offer an unmatched view and are available by the day, week or month. Our upper roadside level offers an additional seven standard motel units. At full capacity, Walleye Lodge can accommodate 116 guests.